Through the help of a friend of mine, I recently discovered the TV series called The Crown Princess (Likit Ruk) from Thailand. The series only has 12 episodes, but each episode is about an hour and a half long. You’d think that watching an episode that long would be boring, but I wasn’t bored because there is a lot going in each episode. 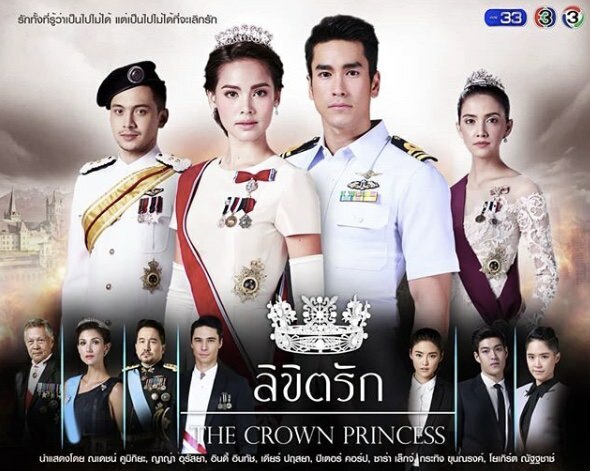 The Crown Princess is, without spoiling it for other people who have not seen the show yet, a romance between a Crown Princess and her Thai bodyguard. She is next in line to the throne of a fictional kingdom called Hrysos (which looked oddly like a place in Europe despite having obviously Asian-looking royalty). The Princess traveled to Thailand for a diplomatic event where her life was threatened (because she is the next in line to the throne). She is forced into hiding under the protection of her assigned bodyguard, the handsome Lt. Commander Davin. I love that the series is short because one of the things I hate about local TV dramas is that they last too long, dragging out popular series to their very last breath even if it means sacrificing the quality of the story in the process. The romantic angle of a famous woman and her bodyguard has been done, but I like that with this series the princess is no pushover. She is not your typical damsel in distress: she can take care of herself and can fight side by side with her protector if necessary. There are several subplots in the series that revolved around the supporting characters, which I liked. Normally I hate when these kinds of side-stories are featured in dramas like this because they take too much time away from the main story but in this show the other stories compliment the main drama, so I didn’t mind. I liked one other potential romance in the show that developed in a way that wasn’t forced or awkward (Alan and Pan). I felt that if they wanted a spin-off of the drama, the story between those two would be it. One big mystery in the show is about who wanted to have the Crown Princess killed. It was a big guessing game to the end. I thought that coming up with all the possibilities and who the eventual perpetrator was one of the great parts of the show. It was not easy to guess who was actually responsible! All the actors in the show were very good. I especially liked the actors who played Prince Alan and Princess Kate. I thought that they showed a depth in their performance and to be honest, I found their roles more challenging than those of the lead actors. There was a progression to the characters of Alan and Kate that were clear from their acting. The lead actors, on the other hand, got to show off their action skills in several scenes and gave fans something to swoon about with their romantic moments. The "kilig" factor was off the charts for those two! The series also gives some insights into mental illness, relationships between a parent and child and about leadership. I liked that it had these elements included in the show. It wasn't all romance and drama. There was something more to it. I loved this series. I’m hoping that I could discover and enjoy more shows from Thailand in the future. In case anyone out there knows any good Thai TV series or movies to watch, is there anything you can recommend to me? Please leave a comment on this post! Thank you for your kind comment. We, Thong Entertainment - the Producer of The Crown Princess, are very happy to read your review and to know that you love this series. Hi everyone! Sorry for the delayed response! I had blog template issues that prevented me from replying to your comments until recently! To Thong Entertainment: You're most welcome! I would love to see more of your future projects! Nantika Soonthornchaikul: Lehlubsalabrang is a rom com? I love rom-coms! Will have to find out where I can watch this!!! To the commenter who recommended Kluen Cheewit :This show looks interesting! Will watch this!!! Thank you for the recommendation!